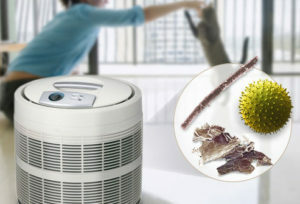 Best Air Purifier for Allergies • The Air Geeks, reviews of air conditioners, dehumidifiers and air purifiers. Why do you need and air purifier for allergies? Why do I need an air purifier for allergies in my home? Which particles is an air purifier capable of capturing? Which filtration mechanism does my air purifier use? What is the minimum size of particles that my air purifier can capture? What is CADR rating and why should I consider it? How does an air purifier help to contain allergies? How do I determine the best size of an air purifier for my house? How effective are HEPA filters? How often should I replace the filters of my air purifier? Where should I position my air purifier for allergies? How much power does an air purifier consume? Can I use my air purifier in more than one place? Well, the question is fair. 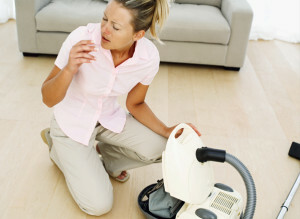 When used properly, air purifiers are a huge help to allergy sufferers. They use filters to strip the air of pollutants and allergens, like pollen, mold and pet dander. Air purifiers and ionizers will also clean the air from other harmful particles, odors and irritants, such as cigarette smoke. If you have pets, for instance, and that one or more of the people in your house are allergic, this can be an excellent tool to clean the air and remove a fair number of the symptoms. However, as you know, no air purifier will ever treat the allergy itself – it is an overreaction of your body to certain allergens, and an air purifiers can just remove some of the allergens from the air you are breathing every day. Now that this word of caution is out of the way, let us get to the pick. An air purifier captures airborne contaminants to ensure that your room has clean and fresh air. Some air purification systems are designed to capture more contaminants than others. An air purifier for allergies captures pollen, dust mites, mold, pet dander, insects, and other airborne pollutants that can trigger allergies. If you or a member of your family is allergic to any of these common pollutants, then an air purifier can help to ensure that the air in your home is clean. Most air purifiers for allergies are designed to capture common indoor allergens such as pollen, mold, pet dander, and dust mites. These allergens can trigger coughing, sneezing, and other allergic reactions. If you are experiencing any allergic reactions, then it is likely that the air in your room is dominated by harmful allergens. An air purifier will help to eliminate them. Most air purifiers offer more than one filtration mechanism. This enables them to capture a wide array of harmful airborne contaminants. HEPA filtration is one of the most effective methods of ensuring that your space is free from airborne contaminants. Studies have shown that HEPA filters are capable of capturing up to 99.97% of airborne pollutants. The effectiveness of HEPA filtration makes it the most preferred method of air purification. In addition to HEPA filters, most air purifiers feature pre-filters and carbon filters. The pre-filter is used for trapping large airborne particles such as hair and insects. Carbon filters are used for removing volatile organic compounds, cigarette smoke, formaldehyde and other bad smells from the air in your space. Allergens come in different sizes. Some are large and visible to the naked eye while others are microscopic. As such, an air purifier for allergies should be capable of capturing nearly all allergens irrespective of their sizes. HEPA filters are designed to capture dust mites, pollen, and pet dander particles that are small as 0.3 microns. Air purifiers catch the smallest elements! If you have vacuumed your place and you are still coughing, sneezing or having other allergic reactions, then the problem could be the microscopic airborne contaminants in your room. An air purifier for allergies will get rid of those and make your house a contaminant-free place. CADR stands for Clean Air Delivery Rate and it is a measure of an air purifier’s capacity to eliminate a specific airborne contaminant from the air it delivers to your room. Developed by the Association of Home Appliance Manufacturers, this rating is provided for three different pollutants: pollen, tobacco smoke, and dust. If there are high levels of these pollutants in your room, then you should select a unit with a high CADR rating. You should also consider the air quality of your space before selecting an air purification unit with a specific CADR rating. There are different ways of controlling allergies. An air purifier for allergies eliminates triggering agents to protect you from allergic reactions. If you have been experiencing bouts of allergic reactions, then an air purifier for allergies will help to create an environment that is free from common allergy triggering agents. The effectiveness of an air purifier mainly depends on its capacity and the conditions of your space. If you have a large room, then you need a high capacity unit and vice versa. If you live in an environment that has high concentrations of pollen, smoke, dust, and so on, then a powerful unit is required to ensure that the air in your space is free from these airborne pollutants. HEPA filters are highly effective in removing a wide range of common airborne pollutants. Designed to capture particles that are as small as 0.3 microns, these filters remove an impressively high percentage of pollutants from the air in your space. The effectiveness of a filter decreases with time and it is, therefore, necessary to replace old filters with new ones. You should replace these parts as recommended by the manufacturer of your unit. In case you have a portable air purifier for allergies, then you can use it in more than one room. However, if you just want to clean the air in your kitchen or bedroom, then you should look for a suitable position within that space. It is also important to consider the number of hours you spend in a given space when selecting a suitable location for your unit. Just like any other home appliance, an air purifier produces noise. The loudness of a unit varies from one appliance to another. The noise level of an air purifier is given in dBs. Air purifiers that produce irritating and disturbing sounds should be avoided if you are intending to use your unit in a quiet environment. The total energy consumed by an air purifier mainly depends on its rated power and operation hours. In most cases, small air purifiers consume less power than high capacity units. If your unit runs throughout, then it is likely to have a significant impact on your electricity bill. Most portable air purifiers have castle wheels that enable users to move them from one position to another with ease. It is easy to use such units in more than room. If you are looking for an air purifier for allergies that you can use in multiple rooms, then you should consider portability when selecting one. Our Achoo! test aims at finding out what the best air purifier is for those of us suffering from allergy, asthma, and MCS. Well, we put some thought and some effort to test out all the different air purifiers on the market and find out the best one to fight allergy. Here is the winner! 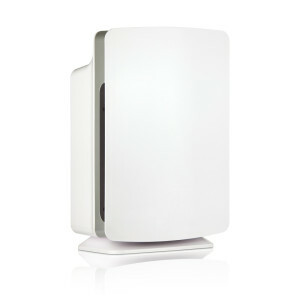 Why?This is the best in class air purifier for anyone allergic to house pollutants. The BreatheSmart has it all figured out adds multiple layers of protection to virtually eliminate all allergy agents and pollutants in your home or office. A very solid, reliable buy for those of us suffering from allergy.